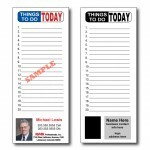 Full Color Note Pads are a great way to remind current and potential clients of your professional services and products and as a useful household or business item it enjoys a longer shelf life than most others which means your message will last longer too. Note pads work! We know they do because we have been designing and selling them for over 20 years. 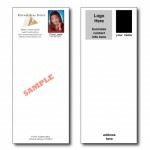 Create your own design or allow us to design for you. 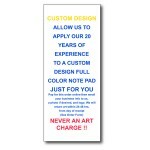 Its never a mistake to distribute note pads. You will love our part of your success……your clients will too.